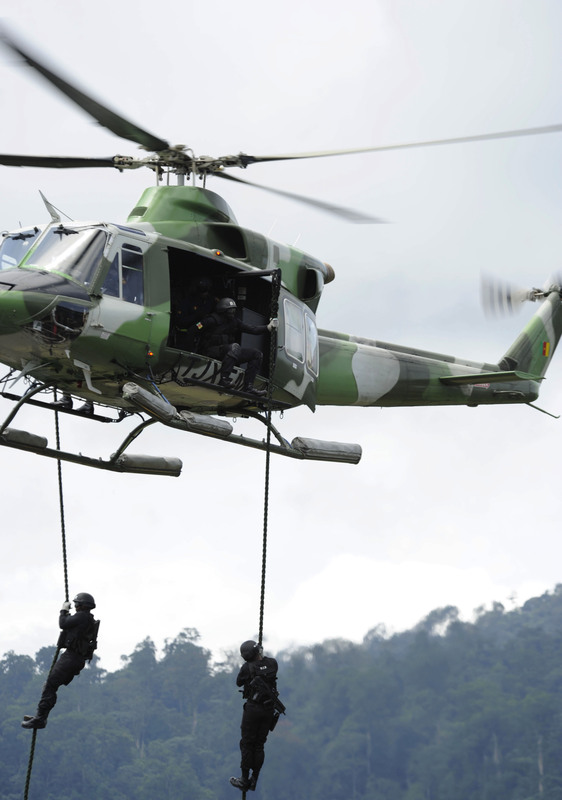 Fighting terror from the sky : Cameroons Rapid Intervention Aviation Force. 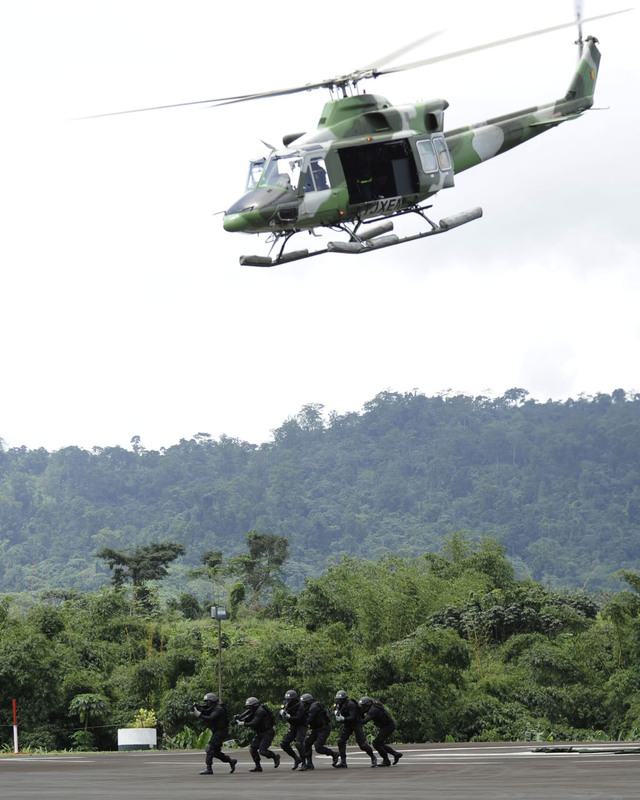 Erwan de Cherisey takes a close look at Cameroon’s rapid intervention aviation force. Since 2013, when a spate of kidnappings took place in its far north province, Cameroon has had to deal with a spill over of the Boko Haram-led Islamist insurgency, which started in Nigeria in 2011. In March 2014, Boko Haram moved against the Cameroonian military for the first time, ambushing an army patrol and killing one of its soldiers. The Cameroonian Defence Forces (CDF) stepped up its counterinsurgency efforts, while Boko Haram increased its attacks against civilian and military targets. As the situation grew increasingly difficult in the far north, Cameroon’s President, Paul Biya, said his country would wage all-out war against the jihadists. This decision was followed by a major build-up of troops to support the newly launched Operation Emergence 4. 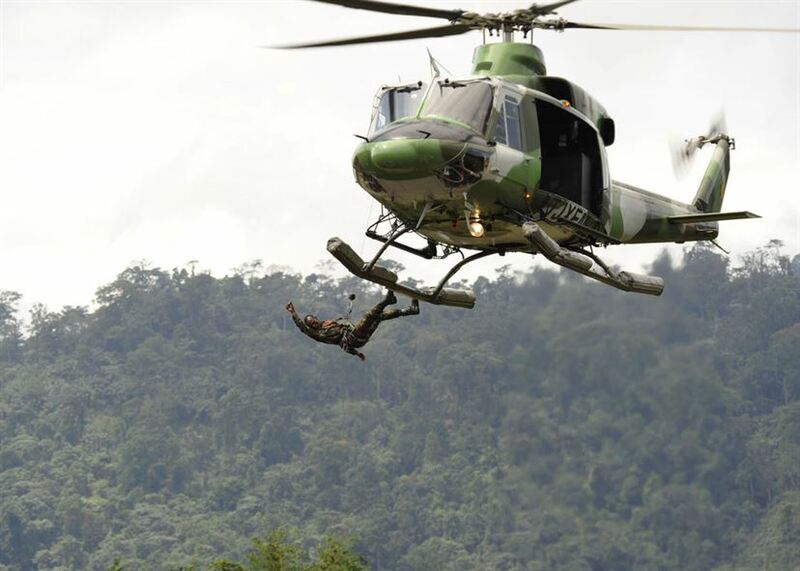 On August 1, 2014, the BIR launched its own anti-terrorist effort, known as Operation Alpha, which currently mobilises more than 2,000 men, mostly from the BIR, although a number of detachments from various Army units are also attached to it. Commanded by Colonel Joseph Nouma, Operation Alpha has its headquarters in Maroua and, while integrated within Emergence 4, it enjoys significant autonomy in the conduct of its operations. Among the BIR units that provide support to Operation Alpha are the Groupement d’Intervention Rapide Aéromobile (GIRAM: Rapid Intervention Airmobile Group), which is currently commanded by Lieutenant-Colonel Moïse Tjeck, and the Groupement d’Observation Aérienne (GOA: Air Observation Group). The BIR Delta was conceived in 2009 as a coastal patrol and security force with a capability for inland operations as well. At the time of its inception, Bakassi Freedom Fighters (BFF), a separatist armed group, which indulged in piracy and threatened shipping lines and oil exploitation within Cameroonian waters, represented the main security threat in Bakassi. BIR Delta’s activities highlighted a need for a dedicated air support capability that could provide the necessary air surveillance and mobility capacities to effectively conduct missions. The first two aircraft – Bell 412EPs TJ-XEM and TJ-XSA – were delivered to the newly formed GIRAM in February 2010, allowing it to be stood up and to begin operations shortly thereafter. The pilots and support personnel for the new aircraft had been selected among Cameroonian Air Force personnel and had been put through an intensive commando training course at the BIR’s instruction centre at Man O’ War Bay, near Limbé in south-west Cameroon, before being sent to Bell Helicopters’ Training Centre in Fort Worth, Texas. On November 22, 2010, the VIP Bell 412, TJ-XSA, crashed with the loss of everyone on board, including Lieutenant-Colonel Abraham Avi Sirvan, the Israeli technical advisor to the Cameroonian presidency responsible for the BIR. 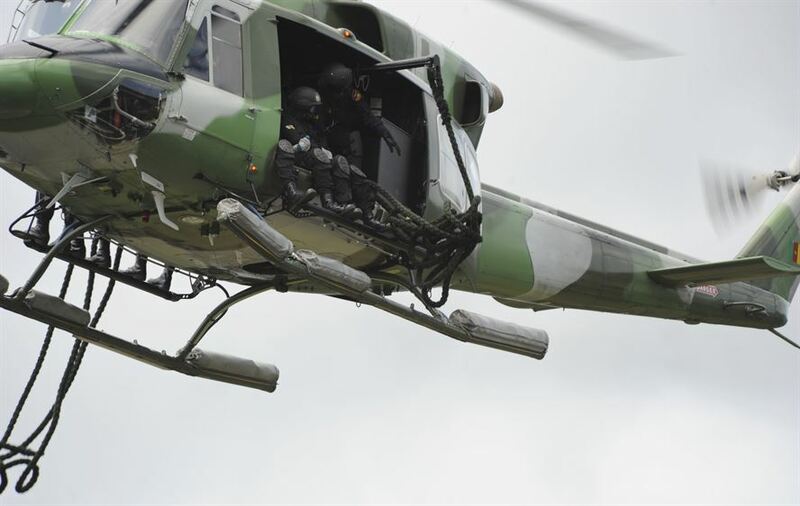 The aircraft was not replaced, but the subsequent delivery of the third Bell 412EP ¬– TJ-XRI – allowed the GIRAM to reach its full operational capability for tactical missions. The two Bell 412EPs are both based at Man O’ War Bay, the BIR’s largest base, which is also the GIRAM headquarters. They are operated by the Maneuver helicopters flight, whose main mission comprises search and rescue (SAR), medical evacuation (MEDEVAC), transport and command support, air patrols and training support to ground units. The Bell 412EPs carry out frequent maritime surveillance patrols in support of the Force BIR Côte (FBC: Coastal BIR Force), a coastguard component of the BIR, which comprises the BIR Delta, and is tasked with maritime security and counter-piracy duties, as well as providing security to Cameroon’s offshore oil exploitation facilities. The aircraft are also deployed inland in support of different BIR operations, most notably the yearly Peace at Bouba Ndjidda anti-poaching operation, which takes place in the National Park of Bouba Ndjidda during the dry season and is currently under way. A single Bell 412EP is usually deployed at Garoua’s Air Base 301 to provide air support to the BIR troops patrolling in the park. As Commander Takouchop Wembe explained, the flight had accumulated more than 3,000 flight hours by early March 2017. Its Bell 412EPs are fitted with emergency flotation systems, a rescue winch with a 600lbs capability, and can be armed with side-mounted machine-guns if required. While they can be used for night flying, they lack night vision goggles. All Bell 412 aircrew undertake visual flight rules (VFR) and instrument flight rules (IFR) training on a second-generation simulator at Bell Helicopters’ Training Academy in Fort Worth, where they return yearly for recurrent training. The beginning of the campaign against Boko Haram highlighted a need for additional intelligence-gathering capabilities to support Operation Alpha. Initially, the Cameroonian external intelligence agency helped fill the void by providing operational teams, as well as small, unmanned air vehicles (UAVs). However, the BIR soon decided it needed to field its own drones and surveillance aircraft and, thus, in 2014, orders were placed for Israeli-made Aeronautics Orbiter IIs mini UAVs, commercial Dji Phantom quadcopters, as well as for a single Cessna 208EX Grand Caravan Special Mission Aircraft. The aircraft were delivered in the first half of 2015 and were integrated into the base at Maroua. A Boeing Insitu ScanEagle arrived in late 2016. The ScanEagle has a much longer range and endurance than the Orbiter IIs and is used in persistent surveillance flights, whether in defensive operations inside Cameroon or in support of offensives into Nigeria. The UAV is also a highly useful tool to support artillery fire missions. The GIRAM’s Cessna 208EX is used in a similar surveillance role to that of the UAVs, but on longer distances and can also be employed in the light transport and liaison role. It is fitted with a forward looking infrared (FLIR) turret and a control station, and has been used in support of offensive operations inside Nigeria since the BIR starting conducting cross-border raids against Boko Haram in late 2015. As a result of the BIR deployment against Boko Haram, in 2014, the command identified a need for additional air support capabilities, which led to the decision to purchase armed helicopters. The aircraft of choice was the Mil Mi-24 because of its heavy armour, strong firepower and wide availability on the second-hand market. Two former Slovak Air Force Mi-24Vs were purchased in Poland. While their delivery had initially been planned for 2015, delays in their overhaul and upgrade resulted in the first example, TJ-XRT (Mamba 02), only arriving in Cameroon in February 2016. The helicopter was reassembled at the Douala’s Air Base 201, where it performed its acceptance flights before being joined by its sister aircraft, TJ-XRP (Mamba 01), in April 2016. The gunships arrived in the far north in June 2016 and, at first, were mainly used in armed patrols as well as reconnaissance flights, as the rainy season limited enemy activity as well as military operations. Starting on December 17, 2016, Operation Alpha troops launched Operation Thunder 1 into Nigeria, targeting the town of Ngoshé and its surroundings. Over a period of five weeks, Cameroonian forces seized Ngoshé and conducted offensive patrols in the villages around it, taking full control of the area before beginning to hand over to the Nigerian military in late January. Throughout Thunder 1, the Mi-24s conducted reconnaissance sorties in support of the BIR troops in Nigeria, as well as monitoring the border. Between February 9 and 12, 2017, the Mi-24s deployed to Air Base 302 at Ngaoundéré, in north Cameroon, to conduct a live firing campaign in order to qualify the air crews and support technicians in the use of the helicopters’ weapon systems. Both Mi-24s fired thousands of 12.7mm rounds with their Yakushev-Borzov Yak-B 12.7mm chin-mounted machine guns, as well as hundreds of rockets from their UB-32 57mm launchers. Each Mi-24 can be armed with four such launchers, and cabin-mounted light machine guns can also be installed to supplement the Yak-B. For self-protection purposes, the helicopters are fitted with ASO-2V flare and chaff launchers, which are mounted under the tail boom of TJ-XRP and in aerodynamic fairings on each side of the fuselage of TJ-XRT. The arrival of the Mi-24 is giving the GIRAM an unprecedented level of firepower that is likely to prove highly useful in combat operation against Boko Haram, as well as offering the BIR a rapid reaction platform to respond in time to Boko Haram infiltrations and ambushes throughout the operational area. The GOA’s UAVs have allowed the BIR to establish an efficient surveillance network, which, together with field and human intelligence, provides Operation Alpha with a highly accurate vision of the tactical situation in areas of operations. Meanwhile, the upcoming beginning of oil exploitation operations in the Bakassi waters is likely to result in a new surge of activity for the FBC, also affecting helicopter operations, which should increase accordingly. Previous Post Previous post:VIRAL: Fight between Russian guard and US diplomat (CIA spy) outside of the US Embassy in Moscow.